Jane Whalley’s cookery career was born when she laid on a spread for her own 21st birthday party. Seasons in ski chalets followed, and as her reputation grew she was hired to cook for wealthy clients – and a few famous names – in London, the Caribbean, the Côte d’Azur and Australia. Jane and her French husband Stéphane run a ski school and a property management company in Meribel, and they have now opened a country retreat in South West France – described as a ‘luxurious foodie’s paradise’ – where Jane puts on residential and day courses for cookery enthusiasts. This book has been written in response to the growing number of clients who have urged Jane to put down some of her skills on paper. 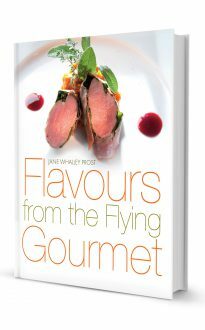 Flavours from the Flying Gourmet offers a range of mouth-watering recipes for every stage of a meal, as well as some practical advice for the kitchen.